At the center of the Love Folly at Montalvo there is a large ornate marble urn on a pedestal. Four faun-like figures, who to me are obviously fellow revellers of the mythological Roman God of the Harvest and wine making, Bacchus (who’s Bacchanalian feats were part of the awakening of old Narnia in the 2nd chronicle, Prince Caspian, sit around the perimeter as if drinking from the fountain itself. 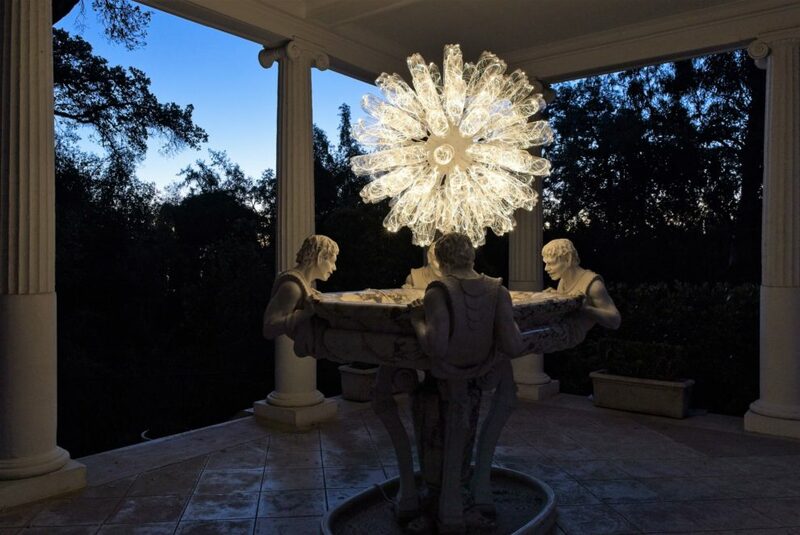 Appearing to float above the fountain, a sphere created from recycled glass wine bottles threaded with optical fibre creates an abstraction of an infinitely flowing wine fountain for the twenty first century (which no doubt would appeal to the party king himself).